“There Never Was a Once Upon a Time,” announces the title of Carmen Naranjo’s book of short stories. But we’re left wondering if she really believes it. Take the title story itself, a tale told (like many in the collection) by a child narrator. Here, the question of whether or not there was a “once upon a time,” a shared past that might inform the present, is up for debate from the opening lines: “There never was a once upon a time, you told me that afternoon at nearly six o’clock, and I answered: you’re a liar, there is always a once upon a time, today, yesterday, tomorrow, because time is always playing upon a time” (11). It’s not that “once upon a time” is taken for granted or given: it has to be constructed, created; “it’s inventing everything from scratch, just like it, with the audacity of someone who feels themselves to be the inventor of what is. That’s some nerve” (11). To say “once upon a time,” then, is to construct a world, and everything in it. Whoever has the keys to this phrase can open up the present as well as the past. Or so the narrator believes. But what follows is a sad little tale of a broken bicycle and a broken friendship, a bicycle who’s owner declares (now that the narrator has smashed it) that there “never was a once upon a time,” that the friendship is over, that it might as well not have existed. One logic, of affection and shared history, has been replaced by another, of material debts and (ultimately) class difference because there’s no way the narrator can every pay her (former) friend back for what she’s broken. In the crash that broke the bike and broke the two girls’ friendship is the most abrupt of transitions to adulthood. And the other girl wants to say that it was always like that; only the narrator insists that there really was a “once upon a time” in which things were different, and perhaps its trace can still be found today. At their best, then, Naranjo’s stories, in their return to childhood and child-like logics, accept the precariousness and temporary nature of the “once upon a time,” but also seek to recuperate some of this other world and deploy it in the present. They recognize, moreover, that childhood is never fully insulated from adult concerns or issues of (say) class, race, and gender. Far from it. But, as with all writing from a child’s perspective (everything from Le petit prince to Mary Poppins), this book seeks to offer an estranged, defamiliarized view of a world that has become all too habitual, all too easily accepted by its adult inhabitants. This works better at some times than at others: here, I find the final story, “Olo,” an extended allegory of a mystical dreamland, both too derivative and too sickly sweet for my taste. But elsewhere, Naranjo’s ambivalence about the virtues of childhood and its invented past is more finely balanced and genuinely revealing. 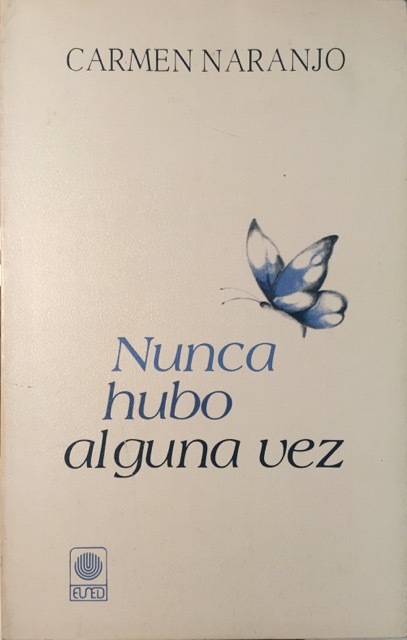 Take for instance the collection’s third story, “Fue una vez” (“It Happened One Day”). In some ways, this is a response to the earlier story discussed above: it, too, is a story of betrayal, but this time from the point of view of the betrayer rather than the betrayed. Again, it’s a first-person narrative in which one young girl writes to another, conjuring up a dramatic moment in which everything changed. Here, the plot (such as it is) turns around a book of cuttings or clippings that the other girl has compiled, though which she narrates her life as she imagines it will unfold: “dressed in a uniform with two long braids and straight hair, dressed as a bride with your white dress and a train covered in ruffles [. . .] your whole life in that collection of clippings” (29). The narrator asks why and how the image could change so dramatically from stage to stage, and gets the response that “it’s for that that you were a woman, and that women could fix themselves up to appear totally different depending on the circumstances” (29). What’s more, the narrator’s interlocutor continues, don’t you see this all the time? Her mother “changes when she has visitors [. . .]. She wears that house coat she saves for special occasions, and haven’t you noticed how she puts on her make-up to go shopping and powders her nose when it’s time to go to the doctor?” (30). This is an initiation into femininity as construction, as an empowered choice to change appearances, to appropriate images from the mass media and elsewhere. Of course, we know that this so-called empowerment has its limits, that no doubt some have more resources to act out some performances rather than others. Perhaps this is the reason, if it is not the sheer shock of this glimpse into an adulthood of mimicry and simulacra, that provokes the narrator to go through the book when her friend is not looking, to seek out its most secret and intimate pages (the last ones, of Snow White in her coffin and then a host of angels) and go tell her father all about it. Yet, having shattered these confidences and seemingly brought everything to light, the narrator’s last words are that she thinks that she, too, needs “to make my own album of cut-outs to see how I want to be from now on” (30). So the rupture, the broken friendship, turns out to be rite of initiation that ensures the continuance of strategies of femininity passed on from one child to another. So these are not particularly complex stories–as befits the possibility that they are addressed perhaps to adolescents themselves. Except that, when you are stuck in it, adolescence and everything that surrounds the move from childhood to (something like) adulthood always seems incredibly complex and full of drastic ups and downs. Naranjo’s stories nicely reflect that sense of drama, the notion that every day could be the end of the world, and portrays it with a light hand that downplays its solipsistic excesses while recognizing that, yes, in fact, in part it is indeed the end of a world that’s at stake.